These 300 Chips are 39 mm diameter casino sized chips and are 11.5 grams in weight. They are produced from a composite resin and an insert that gives them the weight feel of a heavy casino quality chip.The detail on these chips is great. The dice and stripes around the chip as well as the detail on the edge of the chip add to the great appearance. Your Chips will be protected in this aluminum case. It will provide the most protection for your investment. It is made of heavy duty, yet lightweight aluminum available in brilliant silver. The interior is black velour with space for 300 chips, 2 decks of cards, a dealer button and 2 blind buttons. The handles are securely riveted for long lasting use. This is the chip case that will last a lifetime. 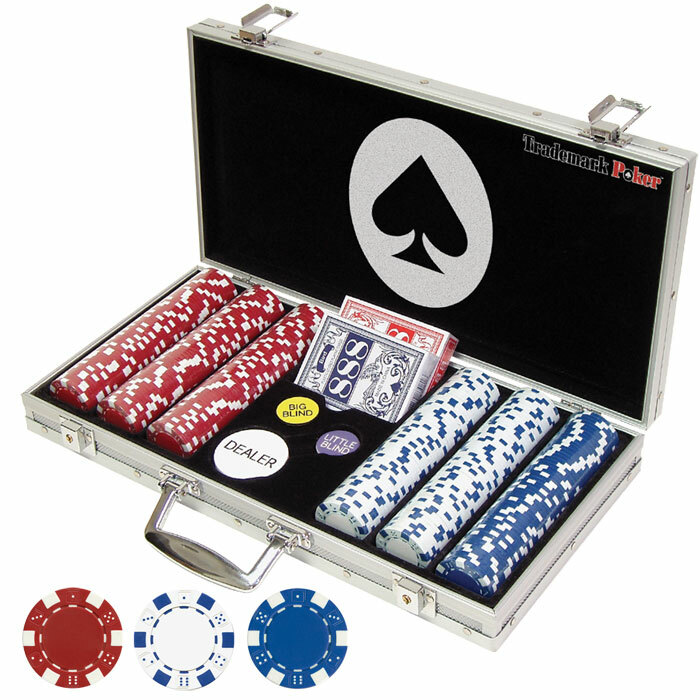 We have INCLUDED IN THIS SET 2 DECKS of CARDS, a professional dealer button and big & little blind buttons.